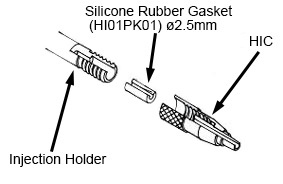 The shape and fitting position of a silicone rubber gasket vary depending on the type of an injection holder. 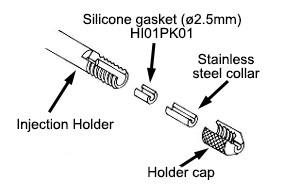 When replacing the silicone rubber gasket, refer to the following instructions and use the procedure suitable for the model of your injection holder. * The HI-7 comes standard with the IM-9A/9B/9C as well as the IM-6/IM-5A/IM-5B/IM-6-2 sold after 2000. 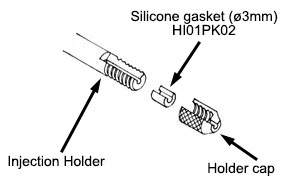 Remove the injection holder cap and replace the worn-out silicone rubber gasket in the injection holder with a new one, and then put the injection holder cap HIC back on. 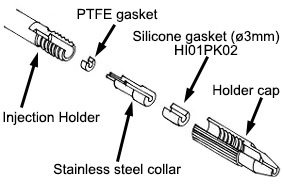 Remove both the end cap and the stainless steel collar from the injection holder and replace the worn-out silicone rubber gasket in the end cap with a new one, and then put the stainless steel collar and end cap back on. 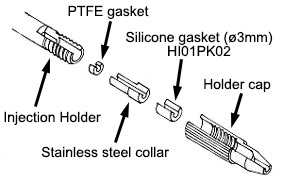 Remove both the end cap and the stainless steel collar from the injection holder and replace the worn-out silicone rubber gasket in the injection holder with a new one, and then put the stainless steel collar and end cap back on. 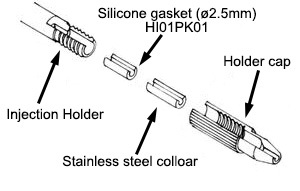 Remove the end cap from the injection holder and replace the worn-out silicone rubber gasket with a new one, and then put the end cap back on.